Hoboken Police Captain Ed Mecka (ret) is a 28 year veteran of the Hoboken, New Jersey Police Department. 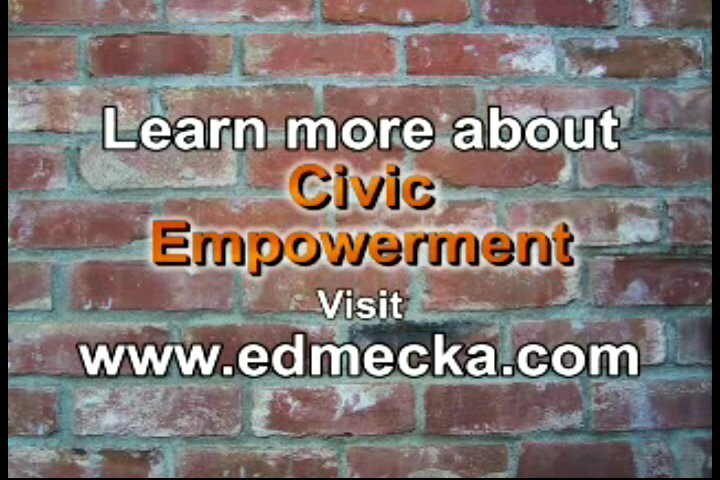 But retirement hasn't stopped Ed from doing what he does best, investigations into political curruption and managing his Hoboken Community Activist website "edmecka.com"
New Jersey's OPRA "Open Public Records Act" and OPMA "Open Public Meetings Act" are the citizens' window into the inner workings of New Jersey government. The Open Public Records Act "OPRA" provides guidelines for the dissemination of “public” government records. Not every government record is “public” and there are restrictions. But for the most part, OPRA does a good job in providing record access. Unfortunately, sometimes even the simplest request for a "public" document can be a nightmare for many citizens. If you know your rights under OPRA and the record is “public”… you should have an easier time getting the requested information. Learn more about OPRA. The Open Public Meetings Act “OPMA” sets a standard for government meetings, i.e. City Council meetings, Freeholders meetings, etc. Learn more about OPMA. Happy birthday to the Open Public Records Act, which turns five today. Read our expanded OPRA related reference materials. Tell Gov. Corzine to Stop Eminent Domain Abuse in NJ! Fourth Ward: Updated: June 14, 2007 Zimmer ahead of Campos by 6 votes after all votes counted and is the uncertified winner. Expect some Court actions and a recount before the final verdict. Talk about pulling a rabbit out of a hat... The Hudson County Democratic Organization (HDOC) "A" ticket successfully won 9 of 13 seats up for grabs in the Hudson County Democratic primary. Congratulations to County Executive Thomas DeGISE, Senator Nick Sacco, Senate candidate Sandra Cunningham, Sheriff Candidate Juan Perez, County Clerk candidate Barbara Netchert, Assembly candidate Anthony Chiappone, Assembly candidate L. Harvey Smith, Assemblywoman Joan Quigley, and Assemblyman Vincent Prieto. The opposition ticket, Democrats for Hudson County (DFHC) won 3 seats in the 33rd District. Union City Mayor / Assemblyman Brian Stack won the nomination for State Senate seat while Hoboken Councilmen Ruben Ramos and West New York Commissioner Caridad Rodriguez get the party nod for the assembly. Rumors flying around Hoboken City Hall are that EIGHT of the NINE City Council Members (all of the Council members with the exception of Councilwoman-at-Large TERRY LABRUNO) are talking about holding a "SPECIAL MEETING" at the SHANNON TAVERN. The reported topic of discussion will be a "NO CONFIDENCE VOTE" on MAYOR DAVE ROBERTS. Of the eight Council members considering the action, six have a solid history of voting in-step with the Roberts Administration. Although the remaining two councilmembers claim to be political foes of the administration, they may have voted correctly against Roberts agenda for the wrong reasons.... They too must share the blame. During the past 6 years, the entire City Council unanimously voted for key Robert's Adminstration initatives, including controversial bonding issues, redevelopment plans, budgets, etc. Do the Councilmembers really believe that their vote of "NO CONFIDENCE" in Mayor Roberts will absolve them from sharing the blame? A "NO CONFIDENCE" vote of the Mayor sends a strong message to the public and now brings into question the actions and conduct of the entire City Council. On election day, May 8th, will the voters decide to take a "NO CONFIDENCE" vote on the actions of the Hoboken City council??? Its been a rough and tumble week for the Robert's administration. Following revela tions that a pro-administration councilman was arrested in NYC for Driving Under the Influence, City Hall was once again rocked with allegations that "FEMALE STRIPPERS" entertained at a Friday afternoon birthday party in the City Hall Parking Utility Office. A city hall source reports that three female Parking Utility workers purchased a "stripper birthday-gram" for a male co-worker. Nothing more, nothing less. There is no doubt that ELECTION FEVER is alive and well in Hoboken where there are SIX Council seats up for grabs in the May, 2007 election. Circus like atmosphere.... Ignore the Clowns! Seems like the big Hoboken news this past weekend was the New York City arrest of Hoboken Fourth Ward Councilman Chris Campos for DUI (Driving Under the Influence). While Roberts Administration foes are no doubt experiencing multiple orgasms over the arrest of the pro-Roberts councilman, the fact remains that under our justice system CAMPOS is presumed innocent until proven guilty in a Court of law. No matter what your political opinion is of Mr. CAMPOS, give him the same respect and rights under the law as you would want for yourself or a member of your family.